Event Description: A little known Southern California jewel, The LA County Museum of Natural History boasts 12 remarkable clue locations that will have you roaring in delight (and puzzlement!) during your corporate teambuilding program. 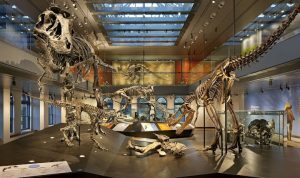 Location History: The largest natural and historical museum in the western United States, the Natural History Museum of Los Angeles County safeguards more than 33 million spectacular, diverse specimens and artifacts. Just minutes from the University of Southern California, in Exposition Park, the NHMLAC opened its doors in 1913 and hasn’t stopped since then, building a world class collection including: “Dueling Dinosaur Skeletons”; grand dioramas of African and American mammals; marine animals; exhibits of Native American and Pre-Columbian cultures; early Hollywood memorabilia; gems and minerals; an insect zoo; and much more. This is a place at which Indiana Jones would’ve felt right at home. Admission not included in program fee.